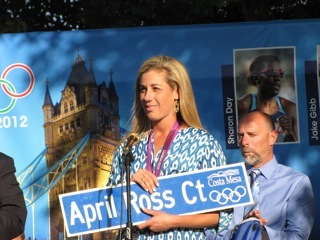 Several hundred people gathered on the lawn of the Costa Mesa Civic Center Tuesday afternoon to honor Costa Mesa Olympians. 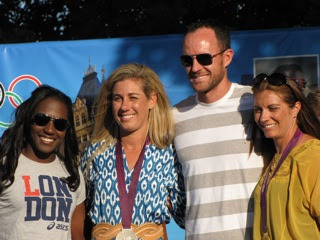 Misty May-Treanor, April Ross, Sharon Day and Jake Gibb were on hand, as were Assistant Olympic Gymnastics coaches Jenny Liang and Hao Quan Liang. 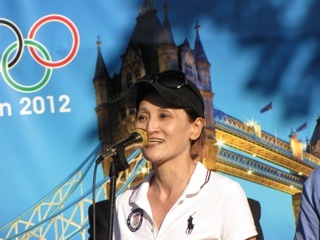 Olympian Kyla Ross was unavailable due to a prior commitment. 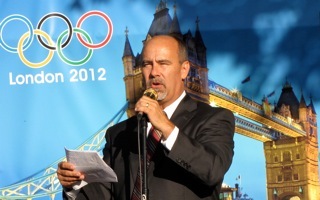 City Chief Executive Officer Tom Hatch was the master of ceremonies for this very special event. 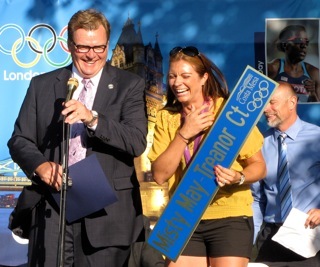 He was joined on the stage by Costa Mesa council members Wendy Leece, Jim Righeimer and Steve Mensinger and, later, by Assemblyman Allan Mansoor. 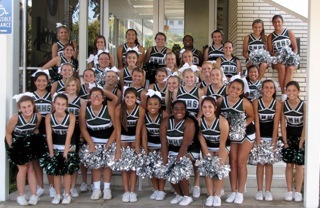 The vivacious young women of the Costa Mesa High School Cheer Squad were on hand to cheer every Olympian as they received their individual recognition. 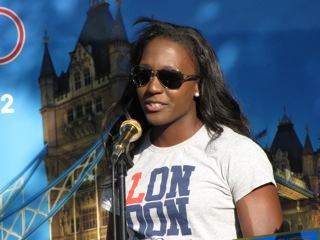 The Olympians mingled with the crowd before the ceremony and signed autographs for eager admirers. 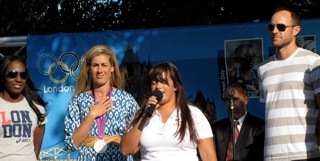 Young Abagail Garcia from Estancia High School sang the National Anthem. Each Olympian spoke passionately about their lives in Costa Mesa and how proud they are to have attended school in our local schools. 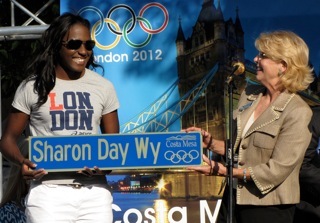 Day, a Costa Mesa High School product, spoke of her life growing up in Costa Mesa, the coaching she received and her pride in the city. 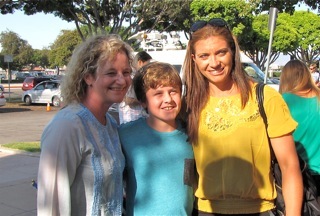 Ross and May-Treanor, who both attended Newport Harbor High School but were residents of Costa Mesa, both expressed pride in being part of this community. 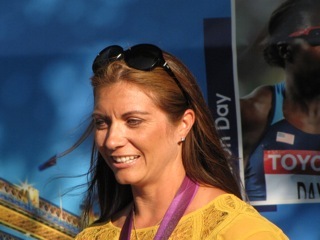 May-Treanor, a three-time Olympic Gold medalist, addressed the young people in the crowd and then de facto passed the torch to Ross, who won the Silver medal in London. Gibb, a Utah native, makes his home in Costa Mesa and hopes to raise his young son here. 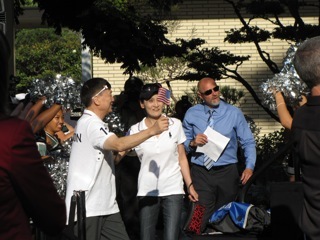 Mr. and Mrs. Liang, who coached Kyla Ross and were coaches on the Olympic team, expressed pride in the City and gratitude to be a part of the Olympic movement. 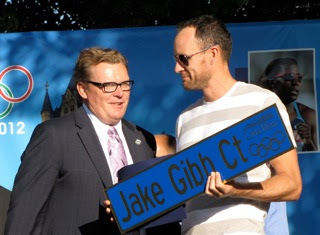 Kudos to Public Affairs Manager Dan Joyce and the rest of the city staff for putting on yet another very inspirational event. It's one more reason why Costa Mesa is a great place to live. 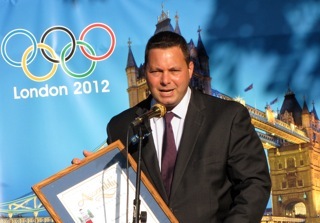 A fine moment for Costa Mesa! 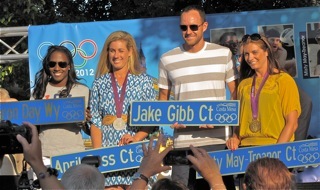 The Olympians are amazing and well deserve this recognition and more. We are very proud of all our Olympians! I laugh at pictures of Katrina Foley. Why is she there? Her kids don't go to Costa Mesa schools anymore, but she still represents us on the School Board. What a traiter. Did she tell the olympians about how our schools are not good enough for her. "I laugh at pictures of Katrina Foley." We saw you at Feet to the Fire, Marty. You laugh at Foley? Have you looked in the mirror lately? At least she showers and changes clothes. You look like one of the homeless you spew so much hate at. Bad news: The National Neanderthal Association just kicked you out. You're too backward even for them.